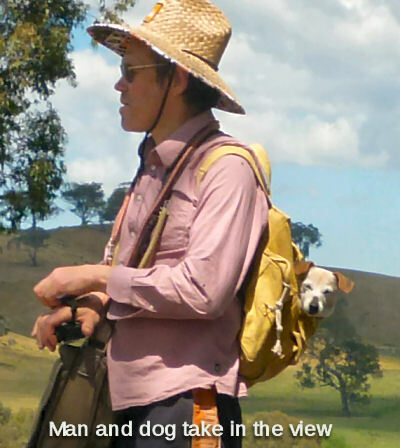 Some time back, a friend of mine won a weekend at Allsop's Paddock Retreat in Gobur, Victoria, Australia. She invited me and another person to go there with her. I had to look up Gobur, which I discovered was about 90km from Mt Buller and 260 from Mt Hotham. There was no town there, and the closest towns were to the south, with Yark 10km away and Alexander 22km. Looking at Google Earth I underestimated the size, beauty and number of the trees. It was impossible to guess at the lay of the land. In fact, we spent two nights there in October 2015. It was a new gig and the owners were hoping for a review. It has taken me a long time to write this review because I preferred to finish the paintings I started when I was there. This review is really an artist's review of a good place to paint. Privacy, safety, comfort and unusual and stunning views. 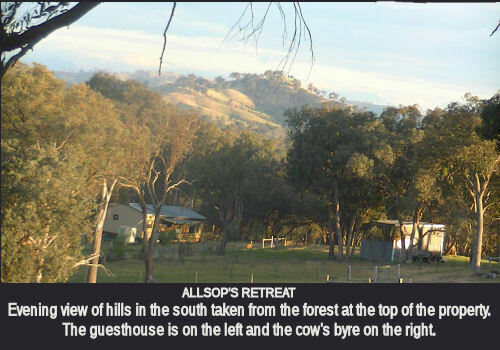 Allsop's Retreat is 37 ha (approx 85 acres) in a shield shape with a plane at the pointy southern end and rolling hills and valleys in the north. 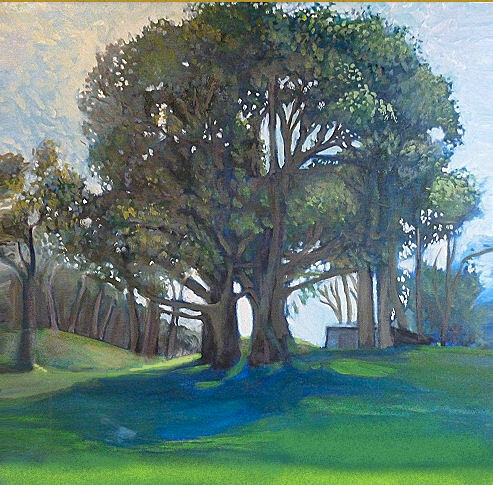 The sun crosses sthe property from east to west, creating a splendid play of light and shadows across the heavily wooded paddocks. Guests stay in a two bedroom, verandahed house, specially built to purpose with a potbelly fire and enough sleeping for eight. (One double bed, two bunks, and a large couch.) Pets are welcome and we brought two dogs. The grounds of the guest house are well-fenced to keep pets in and casually patrolled by three retired cows with fetching hairdos. 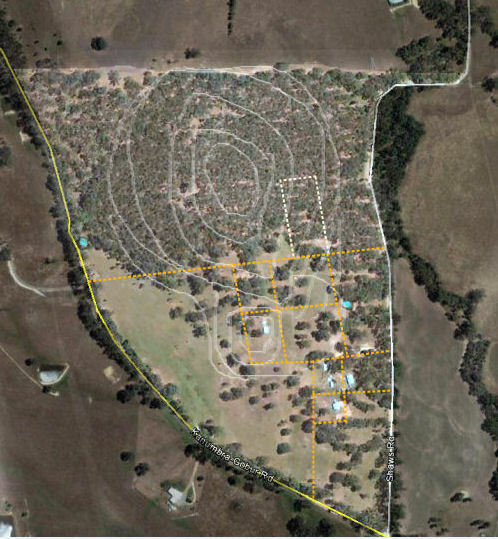 On the aerial view I have roughed in the disused fences in dotted lines, two dams as blue spots, and pale white contour lines to show the main hills. 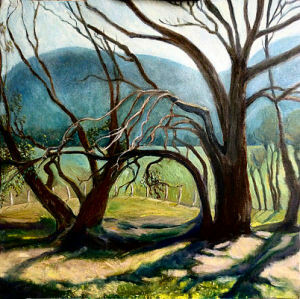 The thickest trees are the forest which covers the largest hill, providing shelter for birds and kangaroos and a variety of walks amongst quite dramatic scenery. There are three enclosed building areas, with the guesthouse or 'shed' at the base. 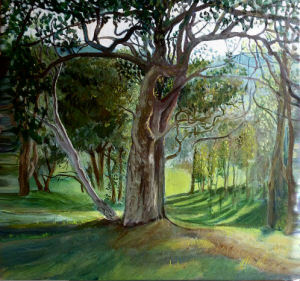 Kangaroos travel regularly down from neighboring hills and up into the forest at the top end of the property. 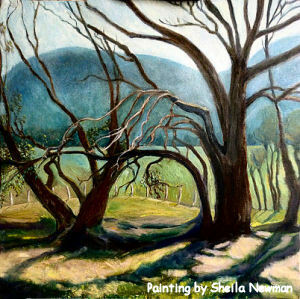 A long paddock follows the plane around the hill between the 'shed' and the forest. Along the way there is a picturesque dam amid gum trees. This large paddock is the main domain of the three retired cows. 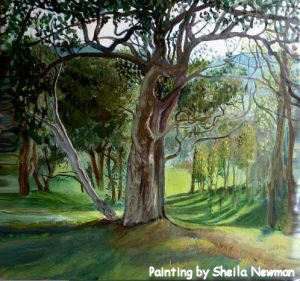 I have included three paintings I did from the property which give some idea of the variety of settings there and the amazing light, as well as some of the beautiful round-leafed red box trees.